Once dissolved the Constituent Assembly decreed by General José Miguel de Velasco, the Marshal Andres de Santa Cruz was called to take over the Presidency of the Republic of Bolivia, who presided over the same on May 19, 1829. The first acts of the government of Gral. Santa Cruz were the sanitation of the country’s economy, the proper administration of the same, and the organization of an army capable of winning the internal and external respect. The Gral. Santa Cruz for the latter, being Marshal of the liberating armies, called the service of the Republic of eminent warriors of the liberation struggles in favor of the independence of South American countries. It was included in the military ranks of Bolivia to the General Francisco Burdett O’Connor, Otto Felipe Braun and William Miller, the Colonels José María Silva, Jose de la Trinidad Morán and Nicolas Medina; to majors, captains, and countless NCOs, of valor and courage. The Cnel. José Ballivian, known for his military value was included in the leadership of the Chiefs of Staff. On August 4, 1831, Marshal Santa Cruz was named Constitutional President of the Republic, Great Citizen and Restorer of the Fatherland. The Republic of Peru, closely linked to Bolivia, was in those years in a desperate convulsion, a civil war provoked by the Gral. Agustín Gamarra, against General Jose Luis Orbegoso and Felipe Santiago Salaverry, who had for others in frank dispersion, and in congested struggles. On May 24, 1835, President Orbegoso confirmed his order, authorizing the entry of the Bolivian army to Peruvian territory. On June 15 the Gral. Ramiro Herrera entered Peruvian territory, with the advanced troops of the Bolivian army. On July 28, entered Peru the Bolivian army, commanded by Marshal Santa Cruz. On August 13, 1835 there was the first meeting with the Peruvian army, led by General. Agustín Gamarra at Yanacocha, being the Peruvian army totally defeated. The Bolivian army was greeted with cheers upon arrival to Cusco. 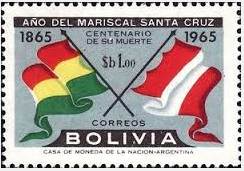 The Peruvian North with the Congress in Huaura, the Peruvian South with its Congress in Sicuani and Bolivia with its Congress in Tapacari; approving the three Congresses the creation of the Confederation and giving the Marshal Santa Cruz all necessary faculties to carry out the union of the three states. Bolivarian Society of Bolivia. Founded in 1926. I was fortunate to have had the chance to work in Lima for a year. I was, and still am, amazed for all the things in common we have with Peruvian society. We should have remained as one country! 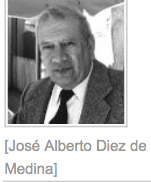 This entry was posted in Bolivia, Economics, Politics and tagged Andrés de Santa Cruz, Bolivian - Peruvian Confederation, history, Peru. Bookmark the permalink.